Image 1: Planai Stadion, designed by Hofrichter-Ritter architects. 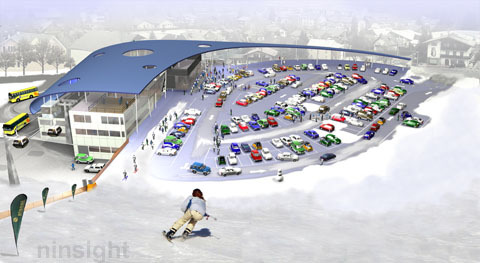 The Planai-stadion, located in Schladming/Austria, consists of a complex roof shape which houses the cabel car station and parts of the administration. It was designed by Hofrichter-Ritter architects. The large surface area of the roof poses difficult questions regarding water drainage. We carried out an analysis of the amount of rainwater, which accumulates during heavy rain at the edges of the roof (see image 2). The channel constructions to cope with the resulting amounts of water were so large that the architecture of the roof shape might have been destroyed. Image 2: Distribution of accumulated rainwater at the edges of the roof. To hide the water drainage from the edges, we distributed a network of channels acroos the roof (see image 3). The channels were located in a way to share the amount of rainwater equally. The collected water is then drained through the dancing (i.e. inclined) columns which carry the roof. 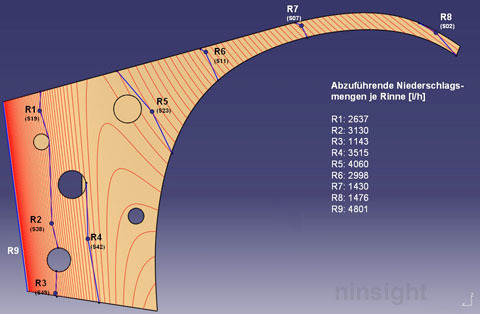 Image 3: Positions of the water drainages.